Prepare your awesome dress and get-ready shoes. The annual Bloggers United Bazaar is on its way to challenge your eyes (and pockets) for yet another fabulous collaboration with fashion and beauty brands to bring you the biggest fashion bazaar in the Philippines. Bloggers United is a yearly bazaar in the Philippines that features the country’s top fashion and beauty bloggers. Due to consistent public demand among fashion and beauty enthusiasts alike, Blogger’s United has already made seven years of exciting and blog-worthy activities for aspiring women and ladies in the country. For this year, Bloggers United has teamed up with Sunsilk to bring fashionistas the biggest and grandest Summer Fair in an outdoor bazaar where top fashion and beauty bloggers will sell their clothes and accessories alike in affordable prizes. There will be over 50+ bloggers’ booths and other spiced up to bring you adventure in #BU7xSUNSILK #SummerFair. There would be game booths, bazaars, salons and more surprises that await every ladies. 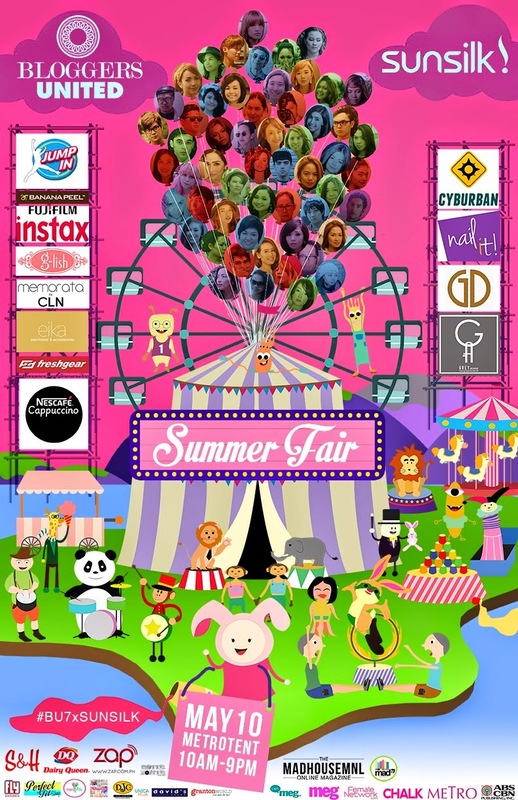 #BU7xSUNSILK #SummerFair will start from 10AM to 9PM on May 10, 2014 at the Metrotent Ortigas. The early bird catches the worm so if want to get the best offers available, be sure to pack early. To get in, you will have to pay a ticket fee worth Php 100.00 or if you are a true blue Sunsilk user, you may bring 180mL Sunsilk Pink bottle and get inside for free. Official hashtag for this event is #BU7xSUNSILK #SummerFair . You may follow Bloggers United on Facebook or Twitter for more details.